Fiberart For A Cause is online fundraising for the American Cancer Society. COLLAGE MANIA is set for May 5 – 7, 2009. The Preview begins April 29. You are going to need all the time between then and May 5 to really LOOK at the art and make your SHOPPING list! says that the goal for Collage Mania 2009 is $20,000. I just got back from Paducah, where I go every year to see the quilts and to take continuing ed as a American Quilter’s Society certified appraiser. Great show! The quilts were fab! The International Quilt Festival in Chicago this weekend is wonderful! Great shopping and fabulous quilts! But better still, go see the show this weekend if you possibly can. You’ll love it! 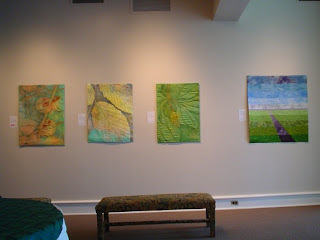 The Professional Art Quilters Alliance-South’s exhibit will open on April 17 – June 7, 2009, at the Allenton and Semans Galleries at the Durham Arts Council, Durham, NC. The exhibition closes April 26th. Be sure to see this magnificent display if you possibly can. This will probably be your only opportunity to see these kimonos, unless you go to Japan. There have been glowing reports from members of the complexcloth and dyers lists on what an outstanding exhibit this is. The Canton Museum of Art in Canton, Ohio, has a Kimono as Art: The Landscapes of Itchuku Kubota exhibit which is on until April 26, 2009. There are other planned activities in conjunction with the exhibit. There is info on Debbi Cooper’s blog about her recent visit. Manuel’s Free-Motion Embroidery Technique is a 4 1/2 minute video on the Threads site. It’s fascinating to see how fast he works and with NO foot or any kind of guard on the machine to protect his fingers. Check it out. You are currently viewing the archives for April, 2009 at Woodhaven Studio's Weblog.